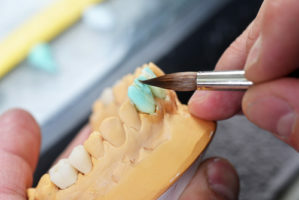 Dental technicians, also known as dental laboratory technicians are individuals trained to manufacture dental prosthetics like bridges, crowns, and dentures. Dental technicians have no face-to-face contact with dental patients. They follow a dentist’s written and verbal directives for a patient much like a pharmacist follows a doctor’s prescription when filling a medication. Although a dental technician rarely, if ever meets patients personally, they have a high degree of responsibility for patient care. Whatever they manufacture for the dentist has to fit correctly and conform precisely to a patient’s teeth, mouth, gums, etc. Construct full and partial dentures. Accurate models from dentist’s impressions. Ceramic crowns using specific techniques. Prepare reports on laboratory activities. Trim and pour denture models. As with all professions, dental technicians must possess certain soft skills and personal characteristics. Employers will look for them in a hiring interview because they know the more of these you have, the more successful you will be. Attention to Detail – You are working from a prescription for a specific patient and must follow it exactly. Critical thinking skills – Everyday won’t be perfect. You will encounter problems and must be able to evaluate solutions and pick the best one. Interpersonal skills – In some cases you are working in a team environment and must get along with other people. Listening skills – Most medical professionals must be able to listen to what is said, and what isn’t mentioned. A dental lab technician is no different. Manual Dexterity – In this job you are working with your hands since you are, technically, building items for patient use. Reading Comprehension – You will be working from written documents, so must be able to understand what they mean. Time Management Skills – Items needed for dental patients must be delivered on time. Most employers provide on-the-job training for dental technicians. You can also get formal instruction at some community colleges and technical schools. But beyond on-the-job training, there are additional levels of education. There are two types of dental laboratory technology certificates. Certificates are not considered “academic” because those programs do not contain general education courses. But you are in school for less time and can enter the job market quickly. The curriculum for the first type of certification focuses exclusively on your technical and applied course work. It will prepare you to take the Certified Dental Technician (CDT) exam. The second certificate is more introductory in nature and is a good place to start if you are exploring the field but aren’t sure if it’s the right one for you. It’s also a reasonable choice if you plan on acquiring employment that offers on-the-job training. The downside is that it does not prepare you to take the CDT exam. If you are still in high school and are interested in this profession, it is a good idea to take courses in computers, anatomy, physiology, and chemistry. Full dentures and partial dentures. Occlusion (how the upper and lower teeth come in contact with each other). Some of these courses may transfer into an associate degree program. Associate degree programs take anywhere from 18-24 months to complete. Obtaining a bachelor’s degree in dental laboratory sciences is another possible path to follow. If you have an associate degree, it’s possible you can enter with advanced standing, which means you may be able to transfer in courses you’ve already taken. The curriculum in a bachelor program is intensive. It is cumulative in that it starts with fundamental and foundational courses that build upon each other. They become increasingly complex, culminating in highly specialized knowledge and skills. If you go directly into a bachelor’s degree program, you will need a high school degree. Some schools may require standardized test scores such as the ACT or SAT. Occasionally a background check is required. Prosthodontics technicians – Design and make dentures. Orthodontic technicians – Design and make braces. Conservation technicians – Focuses on crown and bridge work. Maxillo-facial technicians – Help in reconstructing faces which have undergone trauma. Certification is possible, although voluntary. However, certification may make you a more desirable job candidate. The National Board for Certification in Dental Laboratory Technology is the independent board founded by the National Association of Dental Laboratories (NADL) and offers the Certified Dental Technician credential (CDT). To earn this certification, you will have to take a three-part exam that demonstrates your knowledge and skills. Two sections are written, and one is practical. You may sit for the sections in any order, but all must be passed within four years from the date you pass your first section. An advanced certificate in dental laboratory sciences is also available to help update and maintain your professional proficiency. Talking continuing education classes consistently throughout your career will keep you current with advances in dental medicine and enhance your value as an employee. According to the U.S. Bureau of Labor Statistics, as of May 2017, dental technicians earn a median annual salary of $37,670, or $18.59 per hour. Most work is full time in small laboratories. Between now and 2026, the occupation is expected to grow much faster than average for all occupations. If you are interested in dental medicine but prefer to work behind the scenes, becoming a dental technician may be a good fit for you. But if you like more interaction with patients, you may be more interested in becoming a dental assistant or a dental hygienist.